Gadani is located about 60 km south-west of Karachi, on a 10 km stretch of coastline, it is the largest ship-breaking yard in the world after Alang and Chittagong. Unhealthy working conditions. Gadani is located about 60 km south-west of Karachi, on a 10 km long stretch of coastline, it is the largest ship-breaking yard in the world after Alang in India and Chittagong in Bangladesh. According to Hina Mahgul Rind (Nikkei Asia Review, 17 June 2015), Gadani was the world's largest ship-breaking site in the 1980s, where oil tankers and bulk carriers were taken there to be dismantled. Even now, metal gathered from the Gadani shipbreaking yards meets 80% of steel demand by local rerolling and melting mills and generates 10 billion rupees ($98 million) in revenue for the government annually. This is the estimate made by Dewan Rizwan, chairman of the Pakistan Ship Breaking Association (PSBA). In this region of Balochistan, shipbreaking is still the largest industry and the yards supply steel to about 300 mills. There are two main threats to the industry: a) European regulations, b) import of steel from China at dumping prices. Working conditions are bad. According again to Hina Mahgul Rina, "the roughly 6,000 workers at Gadani take on jobs at their own peril. There are few safety regulations, and certainly no contracts or insurance to fall back on. If a worker dies on the job, his family can only hope the labor union will fork out the mere 200,000 rupees (about 2000 USD) that is often only verbally promised." If they are injured, workers have no local hospital to go to and have to be driven to Karachi for treatment. And they take these risks for wages of three USD a day. PSBA's cairman Rizwan freely admits that Gadani lacks the basic facilities such as access to medical care, clean drinking water, electricity, a sewage system, schools and public infrastructure. But he said that it is the fault of the local Gadani government and not the shipbreaking industry. He said that despite paying high taxes to the federal and provincial authorities, little has been done to improve the area. Rizwan also claims that the Gadani yards have better conditions than others in Pakistan. Environmentalists disagree. Ahmer Bilal Soofi, president of the World Wide Fund for Nature Pakistan, said to Hina Mahgul Rind that current practices of the shipbreaking industry are extremely hazardous, not only to the people involved, but also to the marine life and the overall environment of the area". For comparison, in Bangladesh, the shipbreaking industry is to blame for wiping out 21 species of marine life and endangering another 11, according to the Institute of Marine Sciences and Fisheries at the University of Chittagong. Ships are often full of toxics such as asbestos, lead, ozone depleting substances, PCBs and heavy metals. Little care is given to worker safety or protection of the environment. The toxics sicken the workers and ravage coastal ecosystems. The muddy sand and shifting grounds of tidal beaches cannot support adequate heavy lifting equipment or rapid emergency response, therefore accidents maim or kill countless of workers each year. While ships were dismantled in Europe and Japan in the 70s, the introduction of stricter laws and regulations to protect workers and the environment prompted the shift of shipbreaking activities to South Asia where laws are poorly enforced. The shipbreaking practices in India, Bangladesh and Pakistan have been strongly criticized by local and international groups that demand decent working conditions and environmental justice. As end-of-life vessels contain large amounts of hazardous waste, these ships are governed by international waste laws such as the UN Basel Convention on the Transboundary Movement of Hazardous Waste. An amendment to the Basel Convention which has not yet entered into force at the international level, but is transposed to European Union law via the Waste Shipment Regulation, prohibits any export of hazardous waste from the EU to developing countries. A new EU Regulation on Ship Recycling only allows for ships flying the flag of an EU Member State to be recycled in facilities listed by the European Commission as compliant with European standards. However, it is easy to change flags. Pakistan's shipbreaking industry is also being challenged by cheap metals exported by China. "Chinese producers are looking for avenues to dump their steel products, and Pakistan is a prime target," said Hussain Agha, CEO of Agha Steel, who also blamed China for hampering growth in the Pakistani shipbreaking industry. 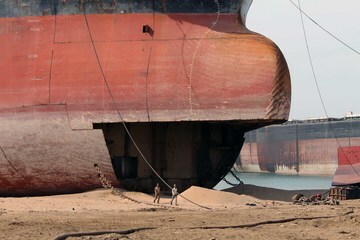 Even if Chinese imports continue to grow, experts said that local shipbreakers can at least ensure that business from EU ships continue to flow this way provided that their yards comply with EU rules. To that end, the Center for Rule of Law, a nonprofit organization that promotes legal rights in Pakistan, has filed a public interest litigation (PIL) in the Balochistan High Court to try and force the federal government to wrest control of the industry from the local government. It is hoped that the federal authorities would then oversee EU compliance. The center has also drawn up a draft law that includes provisions for worker safety, compensation, and the recycling of waste and hazardous materials, in line with International Labour Organization guidelines. The draft law, if adopted by the government, would set the blueprint for industry regulation. As shipbreaking takes place in a very remote location local mobilisation is difficult. Workers organise in trade unions - one of them a yellow union, one of them more independent - to demand their rights. As the waste dumping occurrs in a sparsely populated area, which is also located in a conflict area, the local population has very little means to contest the industry. Project Details The Gadani beaching area has more than 100 plots, mostly owned by a local leaders, with just around 30 owned by the Balochistan Development Authority. Between 2012 and 2014, around 350 ships were sent to Pakistan for breaking on the beaches of Gadani. Other In 2012, the NTUF recorded 12 deaths caused by accidents. Neither the operators nor the authorities document accidents, casualties and occupational diseases, and therefore the real number of casualties is unknown and the dimension of long-term health effects cannot be foreseen. The PSBA, the industry association, denied that there had been any fatal accidents. Other Most of the workers are migrant workers from other Pakistani provinces, in particular impoverished areas such as Swat Valley. The workers do not speak the local language and work in a province which strong political (violent) tensions. - shipbreaking does not take place in modern ship recycling facilities off the beach with minimum technical and infrastructural requirements allowing for the containment of pollutions and workers’ health and safety. The NGO Shipbreaking Platform and its members call on ship owners, to only sell the end-of-life vessels to modern ship recycling facilities off the beach. In 2016, the European Commission will publish a list of clean and safe ship recycling yards, which responsible ship owners can use. - The Federal Government together with the relevant provincial authorities should develop and implement a «Green Ship Recycling Strategy», that is a cross-departmental policy to formalise the sector and to allow for the much needed change towards clean and safe ship recycling off the beach and compliant with international and domestic law, based on guidance offered by the Basel Convention Secretariat, the ILO and the IMO. - The Federal Government and the provincial authorities should seek advice from the international institutions, in particular the Basel Convention Secretariat, the ILO and the IMO, and build partnerships to finance the needed investments in infrastructure. As the investment needed for compliance with international standards, especially with regards to waste management, is beyond the financial capacity of the shipbreaking industry in Pakistan, development banks or the Global Environment Facility (GEF), for example, could assist Pakistan in altering its shipbreaking practices to become safe and clean. - The «Green Ship Recycling Strategy» should provide a roadmap for investments in the technical infrastructure of the shipbreaking yards to allow for the transition towards safer methods off the beach (e.g. impermeable floors and drainage system, heavy lifting equipment, electricity and water supply). - The Government of Pakistan should cooperate with the other shipbreaking countries in South Asia – India and Bangladesh – in a joint effort to exchange experience and alter shipbreaking practices so that competitiveness is not based on the lowest standards, but that instead a ‘level playing field’ is negotiated between shipbreaking countries. - Taking into account already existing legal provisions, the Federal Government together with the Provincial Government need to develop a sector-specific «Regulation for Green Ship Recycling in Pakistan». The new Regulation needs to accommodate the overlaps in responsibilities between the national and provincial level with regards to legal requirements and the institutional framework after the 18th amendment to the Constitution of Pakistan (the decentralisation) and needs to clearly define the competent authorities’ roles. - The new regulation should be based on a comprehensive review of existing legislation and a gap analysis, and should allow for the implementation of international obligations under the Basel Convention as well as the future Hong Kong Convention. - The new regulation needs to set out the authorisation criteria for facilities, to establish a set of rules for facility operation, including the procedures to obtain permits for different kinds of hazardous work, clearly define which authority needs to issue certificates and approvals, and set up an effective facility inspection regime to ensure that shipbreaking only occurs in accordance with the regulation’s requirements. - With regards to hazardous waste management, the “Green Ship Recycling Strategy” needs to include a plan to establish: a reception facility for operationally and non-operationally generated waste at a port close to the yards with a mandatory port call for all imported end-of-life vessels to perform cleaning activities such as cleaning cargo tanks, emptying bilge tanks, paint and chemical stores, and unloading waste oil and surplus fuel, waste storage on the yards, waste reception facilities such as a sanitary landfill, disposal treatment facility for hazardous waste such as PCBs, a system to track hazardous waste and to avoid the repartition into the market, establishment of a testing laboratory with portable equipment, regular monitoring of the presence of contaminants in soil, water, sediments and air. - There is an immediate need for training, awareness-raising and capacity building for workers to ensure safe operations. The government should provide a training centre and seek the assistance of the Basel Convention Secretariat and ILO for further guidance on materials and the organisation of the training45. - With regards to workers’ rights, health and safety and living conditions, and irrespective of trade union membership, the authorities need to accommodate for: the immediate implementation of the applicable laws relative to labour rights, notably the Factories Act 1934, the Industrial and Commercial Employment Ordinance 1968, the Industrial Relations Ordinance 2002, as well as relevant provisions of the Pakistan Constitution and the Pakistan Penal Code, the immediate improvement of workers’ living conditions including supply of drinking water and proper sanitation, the introduction of occupational health and safety procedures, the enforcement of the use of adequate PPE, a health care system for the workers including rapid access to a hospital, the availability of a medical insurance for workers, an adequate system for emergency response, the documentation of casualties, injuries, damages and occupational diseases and effective record-keeping, the provision of contracts or letter of appointments for workers and their automatic registration for social benefits. - With regards to the dangers of asbestos, the sector-specific regulation needs to include strict requirements regarding OHS standards during removal, storage and disposal of asbestos to make sure that workers are not harmed and that elements containing asbestos cannot be re-sold. There is a need for regular medical check-ups. It is advisable to introduce a federal bill on asbestos safety. - The responsible authorities need to monitor the implementation of laws and have enforcement mechanisms in place. This includes a training programme tailored for the designated officials including the judiciary. Compliance needs to be monitored especially with regards to: workers’ registration for social benefits, provision and use of personal protective equipment (PPE), application of environmental, health and safety procedures, use of obligatory on-site pollution control and safety gadgets, periodic monitoring of maintenance and improvements of on-site equipment, provision of sufficient, improved and satisfactory on-site health care system, adequate training status of workers and awareness of hazards, maintenance of hazardous waste inventory and disposal. - The Government of Pakistan should ratify the Basel Ban Amendment and Hong Kong Convention and seek early com- pliance with the provisions under the latter. Moreover, the Government should ratify ILO Convention No. 187 and enforce all the provisions of the Basel Convention. - The Government lease agreements with the economic operators should be conditional and binding to ensure that the operators comply with all provisions. The current lease amount is very low compared to the profit margins and should be adjusted accordingly. Both the revenue from leases and taxes should be invested in upgrading the facilities and the surrounding infrastructure. - The State Bank of Pakistan should issue a directive to commercial banks for compliance with social and environmental safeguard policies and legislation with regards to loans given to the shipbreaking sector. - The Federal Government should support a study to define the level and distribution of contamination in and around the shipbreaking yards, and develop an inventory of hazardous wastes (e.g. for the unmarked asbestos dumping grounds). It should identify “hot spots” that need to be cleaned up. It can seek the international organisations’ expertise and support for this task. The SBC (UNEP) has started a survey in that sense and the Federal Government should make sure they cooperate and access the information gathered. - Both the Federal and Provincial Government need to promote unbiased research on the working conditions and the environmental impact of shipbreaking. They need to allow for transparency and enhance civil society involvement. Moreover, they should embrace the active participation of trade unions and promote their inde- pendent and democratic structures. Why? Explain briefly. Within the Pakistani scenario, the ship breaking industry remains a hazardous industry for both workers and the environment. Despite the fact that Pakistan is one of the world’s largest shipbreaking countries – currently ranking fourth in the annually scrapped volume both in terms of scrapped tonnage and in number of ships – so far only little attention has been given to the sector, both by the government as well as civil society. Due to the lack of adequate technology and equipment as well as deficient law enforcement, proper waste handling procedures are not followed. So far, the sector can neither prevent pollution and the distribution of hazardous materials into the local market nor mitigate the risks of accidents and occupational diseases. Other Comments This case is related to Alang in India and Chittagong in Bangladesh.